This edition is rare indeed, although that does not necessarily make it valuable. The work is the poems of Qiao Chonglie 喬崇烈, who was a jinshi 進士 of 1706 (康熙四十五年) and good at calligraphy, but who seems to be otherwise undistinguished. I have found some half dozen copies of the first part, Xuezhai shiji 學齋詩集, but only three other copies of all four sections, one in Peking University Library 北京大學圖書館, one in Huadong Normal University Library 華東師範大學圖書館, and one in the special collections of the University of Washington Library. The Peking copy is found in the CALIS union catalogue of old Chinese books 學苑汲古—高校古文獻資源庫, but does not seem to be in Peking University’s own catalogue (currently something of a disaster, like many library catalogues these days, including our own). The Washington copy is described in impressive detail in WorldCat, the detail doubtless deriving from Soeren Edgren’s Chinese Rare Books Project. The first problem is when the blocks were cut, and by whom. The sections all seem to have been printed on separate occasions, and although they are alike in size and style, they are all in slightly different formats. There is nothing at all in any of the sections that gives specific information of the edition. All we have to go on is the date of the two prefaces to the main section, the first by Fang Bao 方苞, 1702 (壬午), and the second by Chu Xiongwen 儲雄文, 1710 (庚寅). In the text itself a few of the poems are dated to the 1690s. There seems to have been only one edition, presumably made in the Kangxi 康熙 period. 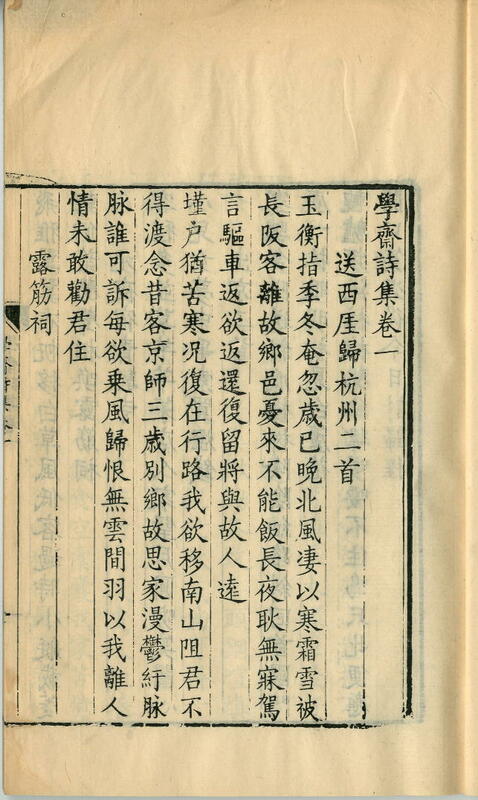 More specifically, the Peking catalogue entry says that the blocks were cut by the Qiao family 寶應喬氏 itself – almost certainly true, but the only evidence to support this attribution appears at the end of the the Jianjia shuwu shi 蒹葭書屋詩 section, where the following words are found:「男溶受百河慎葦仝校字」. The second problem is when the copy was printed. The main section seems to have been printed and circulated before the last three sections were cut, as it is sometimes found without them. But I have not found any evidence that the last three sections were ever printed and circulated independently of the first. The WorldCat entry says that the various parts were combined and printed around 1800 (康熙間板本, 約于1800年左右合印). This is presumably when the last of the sections is reckoned to have been cut. The General Library of the University of Tokyo 東京大学総合図書館 has a copy of the first section which is described as having been cut in 1702 (the date of Fang Bao’s preface) and printed during the Republic (康熙四十一年序刊民國中印本). There are printed labels on each fascicle of the Bodleian copy which read 「…七世孫蔭岡敬題」. I have not been able to find any information about Qiao Yingang 喬蔭岡, but if he was the 7th generation grandson, that could indeed lead to a Republican date for the impression. This is supported by the fact that our copy has an unworn look about it, and bears the Bodleian date stamp 3 April 1934. On to the first leaf of the copy there is pasted a slip of brown paper which reads “From Chun-Nan middle school, Shih-pan-Choa, Nanking”, which I have not yet investigated.